There are a few parts of the home that definitely need an upgrade every once in awhile. Two of those areas that most readily stick out are the kitchen and the bathroom. Appliances that once looked futuristic on Star Trek starts to look like some dated pieces from 20,000 Leagues Under the Sea (though it was the Star Trek of its day, wasn’t it?). As for the rest of your house, you can usually get by with a fresh coat of paint and a good pass of the vacuum or mop. Maybe every so often you can use a steam clean or new carpets. 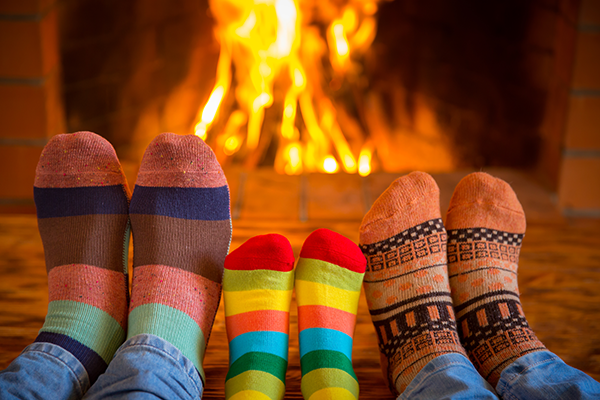 But wait…there’s one more area of the home that can quickly pull your abode into the trash zone – the fireplace. With something so set in stone as a fireplace, you may be wondering how exactly you can change the look of the hearth. You probably think it costs a pretty penny to make any kind of changes to such a fixture, but it doesn’t have to be so. Here are a few simple solutions for upgrades that every homeowner needs. As we mentioned, many areas of your home can benefit just from a fresh coat of paint, and your fireplace is no different. However, it presents an extra challenge, made as it is from different materials than the walls, and projecting out into the room as it often does. You can use these textural differences to your advantage because they play well into the idea of making some painted contrasts. Take a look at the color wheel to get some ideas about how you can really make your fireplace stand out with pop. Colors that are opposite of one another will make pleasing contrasts, as well as black and white. For example, you could turn your fireplace wall into a red accent wall and paint the bricks of your fireplace green. Bonus points are awarded for adding accents that tie them both together, like red and green pictures above the mantel, or red and green items on the shelf above the hearth. You could also try pairing colors that are next to each other on the color wheel if you’re looking for something softer on the eyes with less pop, such as blue and green. Why not decorate your fireplace with some cool items found at local garage sales or thrift stores? Browse style magazines in print and online for some ideas about themes you can play around with, such as Southern living (also the name of a magazine), the Southwest, Colonial, or Oriental. Head on down to the thrift store to find some cool items to hang on the wall or put on the mantle. If your fireplace is looking drab, why not go three-dimensional and add some texture? 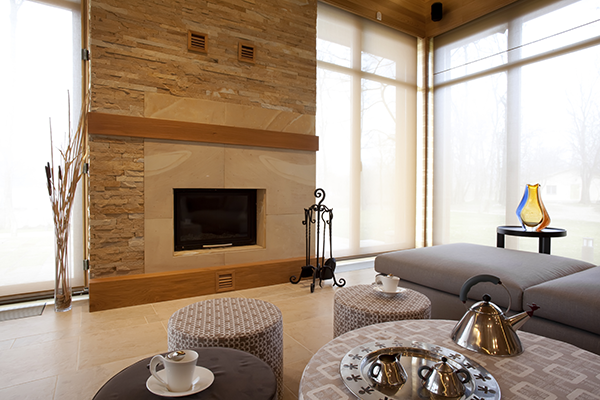 You can choose from a wide variety of stone tile that will really make your hearth stand out in a natural way. With the wide selection offered by the hardware store and companies today, you can get a look that matches the vibe you want in your living room, from geometric slabs of evenly spaced granite to round river rocks. Similarly, you can also get tile to change the look of your hearth and mantle. Tile may not have the textured element offered by stone, but it can offer you a wide selection of colors and patterns to choose from. You could go with something traditional, like blue and white ceramic tiles (popular in Holland and Portugal) or you could go modern with a shimmering selection of rainbow squares. If you have ample wall space around and above the hearth, why not supplement the fireplace with some artistic treasures? You can add shelves to the wall on either side of the fireplace or pull some bookshelves or cubbies together, filling them with artistic items like ceramics and serving utensils. If you don’t think you have such an artistic eye, involve someone who does and who can help you pick out an ensemble that looks good. 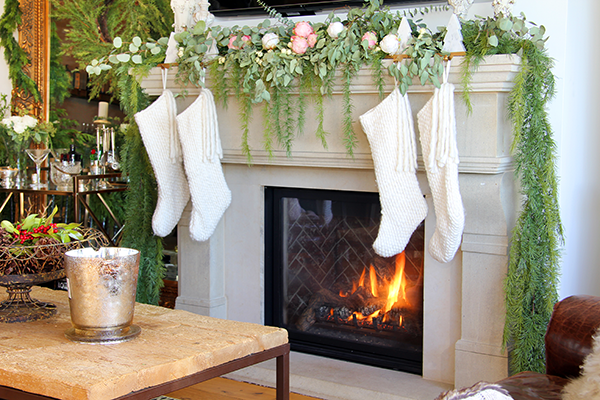 Why not embrace the change in weather and decorate your fireplace for the season? Of course, many people utilize this advice in the winter, putting wreaths, stockings, greenery, and candles above the fireplace. But this suggestion doesn’t have to be limited to the winter season. In the fall you can put pumpkins, gourds, squash, and strands of brightly-colored faux leaves above the mantle. In the spring you can put flowers. In the summer you can put beachy items, like sand in a jar, a lighthouse, and maybe something trendy like a small anchor. Have fun with it and watch your fireplace go from drab to fab. A simple solution includes putting the second mantelpiece higher above the fireplace. From colonial looks to natural beams of wood, a second shelf can be an awesomely easy fireplace upgrade that allows you to put more cool stuff above the hearth. This option is especially great if you didn’t’ have much of a mantle, to begin with (such as a flat-plane fireplace). Another option is to extend the already-extant shelf space of the mantle by placing a new shelf next to or on top if it. The look will be eclectic, but you can run with it by putting some similarly eclectic items for decoration on your new extended mantelpiece. Trompe-l’œil is a French technique that involves painting super realistic looking stuff onto a flat surface so that it actually looks three dimensional…like a door or window opening outside. If you have a flat wall-space around the hearth, why not just paint the classical temple facade you can’t afford (don’t’ feel bad, none of us can afford stately marble columns and classical Greek pediments in our home). You can go all-out with this option, or at least as much as the skill of the painter allows. Whatever your imagination can see is what you can transform your fireplace into with this magic-trick option. This option is not as easy a fix as the other DIY-friendly options we mentioned, but you may find it worthwhile, especially if you can afford to sink some money into building the equity of your home. A professional team can take off the mantelpiece of your fireplace and replace it with something new. These days, there are tons of options regarding different styles, colors, and textures. The kinds of options available for homeowners today were only available to nobles and kings in the past, but with a phone call and a credit card, you can have your living room looking like the office of Louis XIV in Versailles. Just remember that if you leverage this last option, you should put some TLC into the rest of the room, like matching moulding on the ceiling and floor, installing upgraded flooring, etc. Otherwise, your living room could look like the Beverly Hillbillies after winning the lottery. Early Times Home Solutions offers and services chimneys, fireplaces and awnings in the Chicago area and surrounding suburbs. They have beautiful gas log fireplaces, as well as ventless fireplaces. Not only does Early Times provide spectacular fireplaces, but they’ll install it for you. If you’re looking to upgrade your fireplace, talk to a product specialist today and get a free quote.